Summary: On August 15, 2013, Kristofer Helgen from the Smithsonian Museum of Natural History announced the discovery of a new mammal called the olinguito. How was this little animal, a relative of the raccoon and the kinkajou, discovered? Sandra Markle takes the reader through the preceding decade, during which time Helgen studied pelts and skeletons of an animal called the olingo at museums around the world. He noticed that some of them were quite different, enough to possibly be a different animal from the olingo. Eventually, his research led him to the cloud forests of Ecuador and Colombia, where he was able to study the new animal in its habitat, learning enough about it to publish a paper and make his announcement about the new species from the Smithsonian. Includes, glossary, index, and resources to learn more. 40 pages; grades 1-4. Pros: An accessible look at science at work, generously illustrated with photographs and maps. Young scientists will be inspired by the final question: what else is out there? 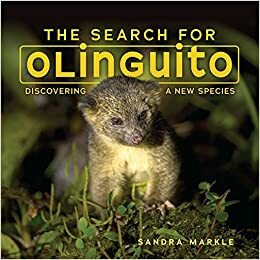 Cons: If I discovered a new species based on my knowledge of the olingo, I would come up with a much more original name than olinguito.